General George Crook, considered by many of his contemporaries, and historians alike to be the US Army's most skilled Indian fighter, respected Native Americans as valiant foes who deserved to be treated fairly and humanely in defeat. The campaign against Geronimo was the last in Crook's military career. Born near Dayton, Ohio, September 8, 1828, George Crook graduated near the bottom of his class from the US Military Academy at West Point in 1852. As a young lieutenant in Oregon and California, he received his first experience with Indians and saw first-hand how they were betrayed when the US Senate rejected 18 negotiated treaties, leaving them with no rights. "When they were pushed beyond endurance and would go on the warpath, we had to fight when our sympathies were with the Indians." Crook later said. Nevertheless, he led successful campaigns against the Shoshone and Nez Perce and others in Washington, Oregon and California. The outbreak of the Civil War in 1861 brought Crook back to the East, where he was promoted to captain and served in guerrilla actions in West Virginia at the battles of Second Bull Run and Chickamauga. He was breveted Major General of Volunteers in July 1864 and was put in command of the Army of West Virginia, taking part in General Philip Henry Sheridan's Shenandoah Valley campaign. In late February 1865, he was captured by Confederate guerrillas but was exchanged the next month. After his Civil War service, Crook was awarded the regular rank of lieutenant colonel and sent back to the Pacific Northwest to subdue the Paiute. After a successful two-year campaign there, President Ulysses S. Grant personally placed Crook in charge of the Arizona Territory with a mission to end fighting between the Apaches and the whites by placing the Apache on reservations. At the age of 43, George Crook is described as being over 6 feet tall, somewhat spare, athletic and sinewy. He had blue-gray eyes, wore his fair hair close-cropped and his beard parted at the point of his chin. He dressed in an old canvas hunting outfit and a pith helmet. He rode a mule named Apache and carried a rifle across the pommel of his saddle. Crook commanded by example, often being the first to rise in the morning and being first in the saddle. His unique Indian fighting style included his extensive use of Indian scouts, a relentless pursuit of Indians on their own territory and a willingness to negotiate rather than engage in battle. Within a few days of assuming command in Tucson, Crook launched a 675-mile expedition into enemy territory with 5 full companies of cavalry and numerous Apache scouts. 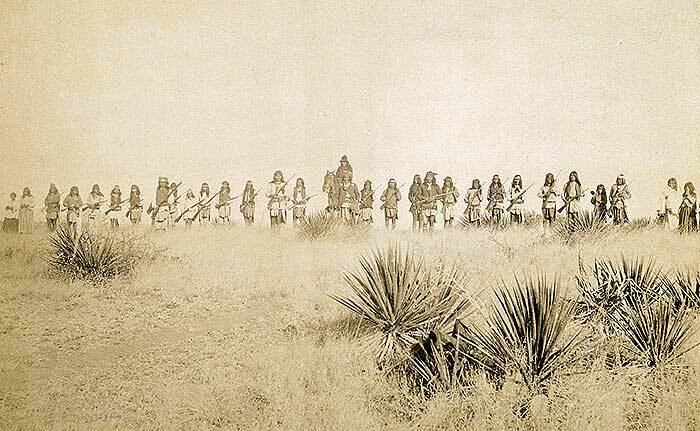 When the expedition arrived at half-completed Camp Bowie in the heart of Chiricahua country 100 miles southeast, Crook held a council with all the chiefs in the area. He listened to the famous and powerful ones -- Miguel, Pedro, Cochise, Pitone and Eskititsla -- who told him they were at peace and wanted to remain at peace. Crook told them what he told all Indians -- that it did not matter who had started the trouble between the whites and Indians, but it could not continue. He told them he would protect them from the bad whites, but the chiefs would have to protect the whites from the bad Indians. If they let the bad Indians raid and steal and kill, it would be impossible to protect the Indians who obeyed the law. Crook knew that more whites were coming, and the Indians could no longer live on wild game, which was already beginning to disappear. Crook believed that until the Indians learned the ways of the whites they would be safe only on reservations. And he believed that as soon as the two races stopped fighting and came to trust each other, the Indians would be able to go anywhere to live and work. Crook promised he would try to find work for those who wanted it, and the Indian workers would be paid the same wages as the whites. He also said that all promises he made would be written down and copies would be given to the chiefs. Crook's subsequent campaign in the Tonto Basin resulted in the defeat of Chief Chalipan (Charlie Pan) and his 2,300 Western Apaches. Crook promised them that work on an irrigation project would start immediately and that he would find markets for their crops so they would be paid directly. He also promised them their own police force, paid for by the Army. Not waiting for Washington to send tools, Crook collected old shovels and picks from all the camps and forts under his command and immediately put the Apache to work building a 5-miles-long irrigation project where they planted 57 acres of melons and other crops. In most of his efforts, Crook was opposed by Arizona citizens who wanted the Apaches exterminated. He was also opposed by the notorious Tucson Ring, a corrupt group of Arizona businessmen who wanted Indians on the warpath so they could continue their profiteering from selling supplies to the military. But by the fall of 1872, Crook had brought peace to the Arizona Territory after crafting a treaty with Cochise, which the chief kept until his death two years later. President Grant promoted Crook to brigadier general and Crook remained in Arizona two more years upgrading military facilities and championing more humane treatment of the Apache and other tribes. Crook was opposed to sending Indian children to boarding schools in the East, but was thwarted in his efforts to establish schools on all the reservations. In 1875 Crook was transferred to the northern Plains to take command of the Department of the Platte, headquartered in Omaha. That winter, Crook defeated the Great Cheyenne chief Dull Knife, then enlisted the Arapaho, Utes, Bannock, Shoshone, Crow and Winnebago in his fight against the Sioux. By the time Crazy Horse surrendered with 1,100 people on May 6, 1877, the last great battles on the Plains were over. In 1882, Crook was ordered back to the Arizona Territory after the Apache had fled the reservations and resumed their guerrilla war under the Chiricahua Geronimo. During the next four years, Crook repeatedly forced Geronimo's surrender, only to see him retreat into the mountains or flee to Mexico. In 1886, Crook was replaced by his long-time rival, General Nelson Miles, who finally brought an end to the Apache war by exiling Geronimo and his band to Florida, along with the Apache scouts who had served both generals so well in the defeat of their own people. This was an act for which Crook never forgave Miles. The campaign against Geronimo was the last in Crook's military career. He was ordered back to the Department of the Platte, where he maintained peace with the Plains Indians. In 1888, President Grover Cleveland promoted him to major general and placed him in charge of the huge Department of the West. During his final years, Crook continued his lifelong campaign in favor of his former enemies, speaking out against white encroachments, unfair treatment, broken treaties and failed federal policies. 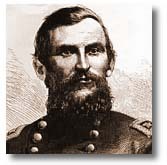 On March 21, 1890, General George Crook suffered a heart attack and died in Chicago, Illinois. He was originally buried in Oakland, Maryland, but was moved, together with his wife, to Arlington National Cemetery on November 11, 1898. Crook Walk in Arlington National Cemetery is named for him.